Vineyard USA has a national partnership with Convoy of Hope to get aid to areas around the United States and the world when disaster strikes. Your church can make a difference by donating to Convoy of Hope, and praying for them when they are in action. Extending the Kingdom of God through church planting and missional living. As a faith-based, international, humanitarian-relief organization strategically based in Springfield, Missouri — the crossroads of America — the goal of Convoy Of Hope is to bring help and hope to those who are impoverished, hungry and hurting. See the video on our partnership from our 2017 National Conference below. Our Vineyard USA Official National Relief partner, Convoy Of Hope, is a first-responder to disasters at every turn. Please join us in prayer and support of their efforts, as they serve those in need. To see how they are at work during Hurricane Harvey, click here. How can you and your church get involved with Convoy Of Hope? GIVE: Support Convoy via their website. FOLLOW: Get Convoy’s updates on their Facebook page. PRAY: Pray for all those impacted by a natural disaster as it happens, and for the vulnerable to get to safety. 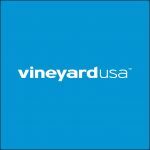 Vineyard USA has an official partnership with CONVOY OF HOPE to get aid to areas around the United States when disaster strikes. As a faith-based, international, humanitarian-relief organization strategically based in Springfield, Missouri — the crossroads of America — our goal is to bring help and hope to those who are impoverished, hungry and hurting. Each year — in dozens of communities throughout the nation — guests of honor receive free groceries, health and dental screenings, haircuts, family portraits, hot meals, job-placement assistance and much more at our signature events. We partner, resource and empower rural churches through training, mentoring and coaching so they can enhance their presence in their communities. The strategy works best when church leaders partner with community leaders and stakeholders. Nearly 150,000 children in 10 nations are being fed nutritious meals by us. The food opens doors for education, clean water, a sense of hope and much more. Currently, we are feeding children in the Philippines, El Salvador, Nicaragua, Honduras, Haiti, Kenya, Ethiopia, Guatemala, South Africa and Tanzania. Impoverished farmers and families are equipped with the skills, tools and seeds to produce life-sustaining crops through the agricultural work we conduct throughout the world. Each year, tens of thousands of meals are harvested for our children’s feeding work and income is generated for farmers. Consistently among the first to respond to disasters throughout the world. We are highly regarded for our scalable distribution model, Disaster Response teams, six international warehouses and Mobile Command Center. We empower like-minded organizations, who are doing good work among the poor and suffering in their communities. This is accomplished by providing such friends with food, water, supplies and much more. If you or your church would like to give to Convoy of Hope, click here. 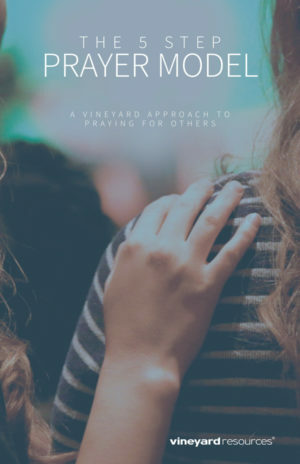 Perhaps no idea is more central to what it means to be “Vineyard” than how we pray for others. The 5 STEP PRAYER MODEL has been used to train thousands of Vineyard people around the world how to interactively pray for another while listening to the leading of the Holy Spirit. 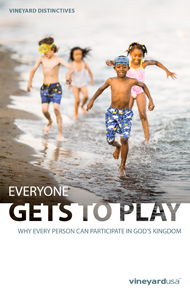 "Everyone Gets To Play" is a phrase used around Vineyards all over the world. But what does it really mean, and how can an average Christian "get in the game?"